Apple is rumored to be drawing down build plans for current iPhone models ahead of product refreshes in the second half of 2013, which has prompted Sterne Agee to reduce its forecasts. Citing checks within Apple's supply chain, analyst Shaw Wu reported in a note to investors on Friday that the reduced build plans correspond with evidence of a forthcoming "iPhone 5S," as well as a low-cost iPhone made out of "composite material casing." Wu believes Apple will likely hit the lower end of its guidance for the current quarter. While not ideal, he said that result is better than some market watchers who expect Apple to completely miss its own guidance. 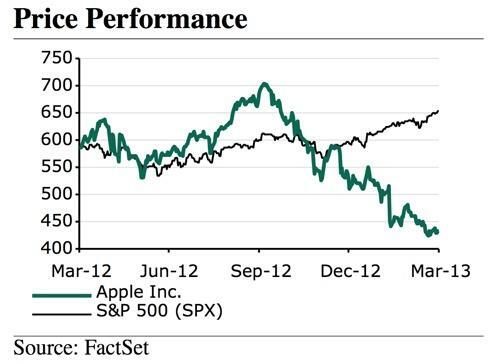 Sterne Agee has accordingly cut its price target for Apple's stock from $715 to $630. The adjustment comes after shares of AAPL have fallen nearly 40 percent from their 52-week high. "The supply chain is very complex, and we obviously have multiple sources for things. Yields may vary, supplier performance may vary." - Apple CEO Tim Cook in January, cautioning against reading into supply chain data. Wu's adjusted expectations are based on what he's heard from Apple's supply chain  a strategy that Apple Chief Executive Tim Cook cautioned against earlier this year. Speaking during his company's quarterly earnings conference call, Cook warned investors that it's inadvisable to place much faith in such reports. "The supply chain is very complex, and we obviously have multiple sources for things," Cook said. "Yields might vary, supplier performance might vary." Cook admitted that certain data points that leak out of suppliers may be accurate, but even if the information is true, it's "impossible" to determine what that data actually means for Apple's business. Of course, that hasn't stopped analysts from attempting to decipher whatever they can from Apple's Far East supply chain. And Wu is not alone in having heard rumors of order cuts made by Apple  reports have have prompted a number of analysts to reduce their price targets for the company.